Experimental autoimmune encephalomyelitis (EAE) serves as a model for multiple sclerosis and is considered a CD4+, Th1 cell-mediated autoimmune disease. IL-12 is a heterodimeric cytokine, composed of a p40 and a p35 subunit, which is thought to play an important role in the development of Th1 cells and can exacerbate EAE. We induced EAE with myelin oligodendrocyte glycoprotein (MOG) peptide 35–55 (MOG35–55) in C57BL/6 mice and found that while IL-12p40-deficient (−/−) mice are resistant to EAE, IL-12p35−/− mice are susceptible. Typical spinal cord mononuclear cell infiltration and demyelination were observed in wild-type and IL-12p35−/− mice, whereas IL-12p40−/− mice had normal spinal cords. A Th1-type response to MOG35–55 was observed in the draining lymph node and the spleen of wild-type mice. A weaker MOG35–55-specific Th1 response was observed in IL-12p35−/− mice, with lower production of IFN-γ. By contrast, a Th2-type response to MOG35–55 correlated with disease resistance in IL-12p40−/− mice. Production of TNF-α by microglia, CNS-infiltrating macrophages, and CD4+ T cells was detected in wild-type and IL-12p35−/−, but not in IL-12p40−/−, mice. In addition, NO production was higher in IL-12p35−/− and wild-type mice than in IL-12p40−/− mice. These data demonstrate a redundancy of the IL-12 system in the induction of EAE and suggest that p40-related heterodimers, such as the recently cloned IL-23 (p40p19), may play an important role in disease pathogenesis. Experimental autoimmune encephalomyelitis (EAE)3 is a CD4+ T cell-mediated demyelinating autoimmune disease of the CNS and serves as a model of the human disease multiple sclerosis (1). The pathogenesis of EAE comprises immunization with encephalitogenic myelin Ags in the presence of adjuvants, presentation of such Ags to T cells, migration of activated T cells to the CNS, and development of inflammation and/or demyelination upon recognition of the same Ags. An important aspect of the pathogenesis of EAE, with potential for therapeutic manipulation, is the role of cytokines in the inflammatory process. IL-12 is a pleiotropic cytokine that is produced by activated APCs, such as dendritic cells, monocytes/macrophages, and microglia, in response to bacterial products and immune signals (2). 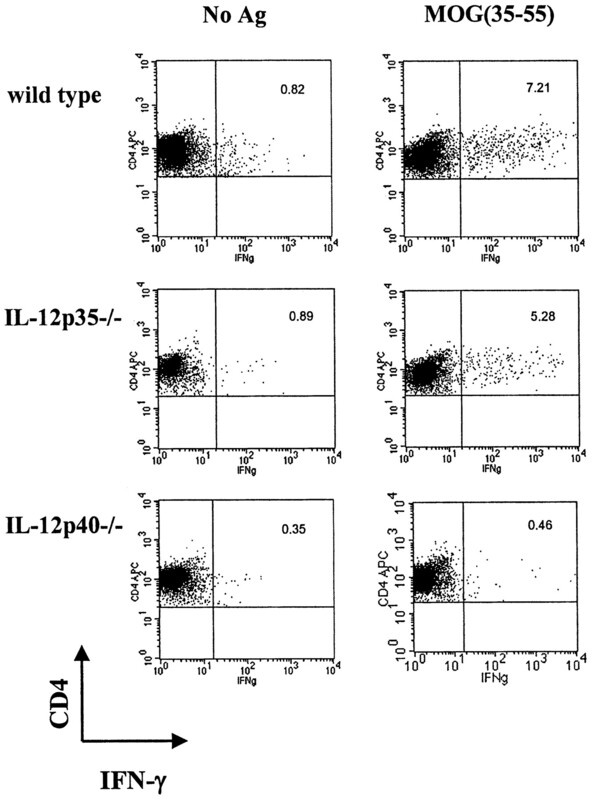 IL-12 acts as a proinflammatory stimulus by activating NK cells and is one of the key factors in the differentiation and expansion of Th1 cells, which produce proinflammatory cytokines such as IFN-γ and TNF-α (3, 4). CD4+ cells of the Th1 phenotype play a critical role in the induction of EAE. A role for IL-12 in the pathogenesis of EAE has been documented by several lines of evidence. Treatment of encephalitogenic proteolipid protein-reactive T cells with IL-12 in vitro enhanced their ability to induce EAE (5). Abs against IL-12 were capable of preventing the induction of EAE when administered early after the adoptive transfer of encephalitogenic T cells to recipient animals (5, 6). Administration of high doses of IL-12 in the otherwise monophasic EAE model in the Lewis rat induced disease relapse (7). IL-12 is a heterodimeric cytokine formed by a large (p40) and a small (p35) subunit. These are linked by disulfide bonds in the producer APC to yield bioactive IL-12 (p70). It has been shown that IL-12p40-deficient (−/−) C57BL/6 mice are completely resistant to EAE induced by myelin basic protein (MBP) peptide 86–104 (8). IL-23 (p40p19) has been recently described as a novel cytokine which shares the p40 subunit and several biological functions with IL-12 (9). Because targeted deletion of the IL-12p40 gene eliminates the expression of both IL-12 (p40p35) and IL-23 (p40p19), it is not clear whether the proinflammatory response in EAE is due to IL-12 and/or other p40 heterodimers such as IL-23. The goal of the present study was to determine the role of IL-12p40 and IL-12p35 in EAE induced by the immunodominant myelin oligodendrocyte glycoprotein (MOG) peptide 35–55 (MOG35–55) in the C57BL/6 mouse. We report that IL-12p35−/− mice are susceptible to EAE, while IL-12p40−/− mice are completely resistant. These findings show that IL-12 is not strictly required for the induction of EAE, and suggest a role for other p40-related heterodimers such as IL-23. Eight- to 10-wk-old homozygous IL-12p35−/− and IL-12p40−/− C57BL/6 mice and their wild-type controls were purchased from The Jackson Laboratory (Bar Harbor, ME). To induce EAE, mice were each injected s.c. with 300 μg of MOG35–55 in CFA containing 4 mg/ml Mycobacterium tuberculosis H37Ra (Difco, Detroit, MI) over two sites at the back. Pertussis toxin (200 ng) was given i.p. on days 0 and 2 postimmunization (p.i.). EAE was scored according to a 0–5 scale (10) as follows: limp tail or waddling gait with tail tonicity, 1; waddling gait with limp tail (ataxia), 2; ataxia with partial limb paralysis, 2.5; full paralysis of one limb, 3; full paralysis of one limb with partial paralysis of second limb, 3.5; full paralysis of two limbs, 4; moribund, 4.5; and death, 5. On day 21 p.i., mice were extensively perfused, and spinal cords harvested. Five-micrometer sections were stained with Luxol fast blue (myelin stain; Sigma-Aldrich, St. Louis, MO). Slides were assessed in a blinded fashion for inflammation and demyelination as described (11). Mononuclear cells (MNCs) from the CNS of MOG35–55-immunized mice were isolated by Percoll gradient centrifugation by modification of published methods (12, 13). Briefly, mice were sacrificed and transcardially perfused with ice-cold GKN solution (2 g/L d-(+)glucose, 0.4 g/L KCl, 8 g/L NaCl, 3.56 g/L Na2HPO412H20, and 0.78 g/L NaH2PO42H20; pH 7.4) (14) with 2 U/ml heparin (Sigma-Aldrich). Brains and spinal cords were removed into GKN/0.02% BSA (w/v), mechanically dissociated through a 100-μm-cell strainer, and enzymatically digested by incubation with 250 μg/ml collagenase/dispase and 250 μg/ml DNase I (Roche, Basel, Switzerland) at 37°C for 20–30 min. The digested CNS preparation was washed with GKN/BSA, and the pellet was fractionated on a 70/37/30% Percoll gradient. MNC (microglia and infiltrating MNC) and lymphocytes were recovered from the 37/70 interface, washed, and resuspended in RPMI 1640 with 10% FCS. Pooled cells (1 × 106) were washed in FACS buffer. After blocking with CD16/CD32 Abs, cells were incubated with Abs to murine CD4, CD8, CD11b, and CD45, (all from BD PharMingen, San Jose, CA). Production of TNF-α was analyzed by intracytoplasmic staining of CNS-derived cells with Abs to murine TNF-α (BD PharMingen) after culture for 4 h in the presence of the protein transport inhibitor brefeldin A. Where indicated, 50 μg/ml MOG35–55 was added to activate CNS-derived cells for 4 h in vitro. Data were acquired on a FACSCalibur (BD Biosciences, Mountain View, CA), and data were analyzed using CellQuest software (BD Biosciences). Suspensions of MNCs from the inguinal and popliteal lymph nodes or from the spleen were prepared on day 21 p.i. Cells were cultured at a cell density of 2.5 × 106/ml in medium containing MOG35–55 at a final concentration of 25 μg/ml, Con A at 5 μg/ml, or without Ag/mitogen. Supernatants were collected after 48 h. Quantitative ELISA for IFN-γ, IL-2, IL-3, TNF-α, IL-4, IL-5, and IL-10 were performed using paired mAbs according to the manufacturer’s recommendation (BD PharMingen). Where indicated, brefeldin A was added to cells cultured with or without MOG35–55 for 48 h during the last 4 h of culture, and production of cytokines was determined by intracytoplasmic flow cytometry as described above. For proliferation, cells were cultured in triplicate wells of microtiter 96-well plates (4 × 105 cells/well) in the presence or absence of 50 μg/ml MOG35–55 or 5 μg/ml Con A. After 60 h of incubation, the cells were pulsed for 12 h with 1 μCi of [3H]methylthymidine. Cells were harvested and counts read with a beta counter (Microbeta; Applied Biosystems, Foster City, CA). The results are expressed as cpm. Production of the NO metabolite nitrite was measured in the supernatants using the Griess reagent. One hundred microliters of supernatants was mixed with an equal volume of Griess reagent. After a 10-min reaction at room temperature, the absorbance at 540 nm was measured in an automated plate reader. Nitrite concentration was determined by comparison with a sodium nitrite standard curve in culture medium. ANOVA was used for the comparison of clinical score, proliferative responses, and cytokine profiles among different groups. All significance tests were two-sided. To investigate the role of the two IL-12 subunits in the pathogenesis of EAE, we immunized IL-12p35−/− and IL-12p40−/− mice on the H-2b background and their wild-type controls (C57BL/6 mice) with MOG35–55 in CFA. IL-12p40−/− mice were completely resistant to EAE. A representative experiment of three is shown in Fig. 1⇓. By contrast, IL-12p35−/− mice developed EAE that was comparable in time of onset and severity to EAE observed in wild-type mice. IL-12p35−/− are susceptible to EAE, while IL-12p40−/− mice are resistant. Female wild-type, IL-12p35−/−, and IL-12p40−/− mice (n = 5 in each group) were immunized with 300 μg of MOG35–55 in CFA. Clinical EAE was scored daily according to a 0–5 severity scale. Data represent the mean clinical scores ± SEM. The overall clinical score was not significantly different between wild-type and IL-12p35−/− mice. One representative experiment is shown. Histological analysis of spinal cords harvested from perfused animals on day 21 p.i. showed typical EAE, with MNC infiltration and demyelination in wild-type mice. A representative histopathology picture is shown in Fig. 2⇓. Consistent with clinical findings, mononuclear cellular infiltration and demyelination in IL-12p35−/− mice were similar to those observed in wild-type animals. By contrast, IL-12p40−/− mice had normal spinal cords (Fig. 2⇓). Spinal cord histology. Wild-type, IL-12p35−/−, and IL-12p40−/− mice were immunized with MOG35–55 in CFA and sacrificed at day 21 p.i. after extensive perfusion. Spinal cords were harvested and 5-μm sections were stained with Luxol fast blue (myelin stain). Magnifications of ×4 and ×40 are shown. Wild-type mice exhibited typical EAE cellular infiltration and demyelination (upper panels). 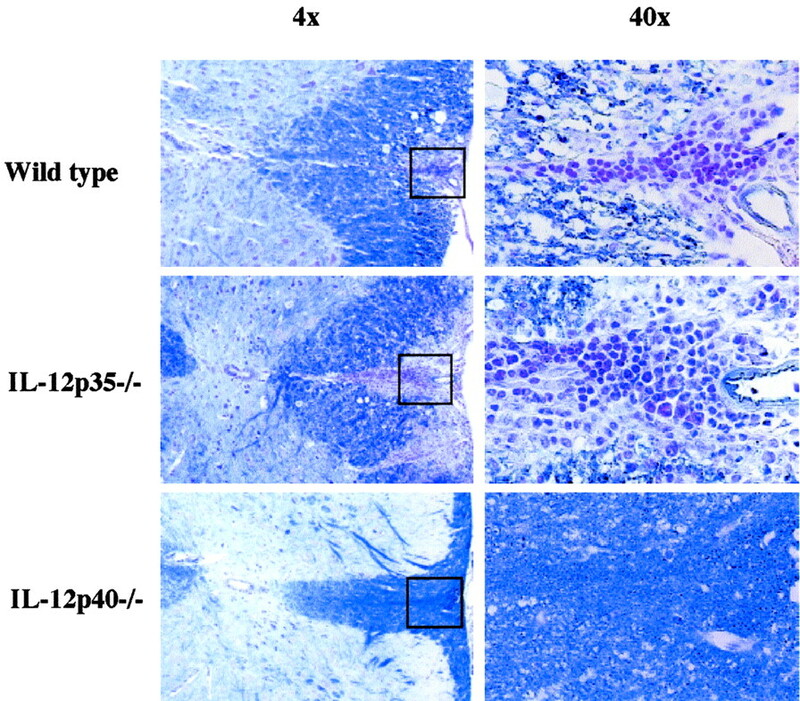 IL-12p35−/− mice exhibited similar cellular infiltration and demyelination (middle panels), while IL-12p40−/− mice had normal spinal cords (lower panels). On day 21 p.i., cells isolated from the LN and the spleen strongly proliferated in response to MOG35–55, without significant differences between wild-type, IL-12p35−/−, and IL-12p40−/− mice (not shown). We cultured cells harvested from the draining lymph nodes and the spleen at day 21 p.i. in the presence or absence of 25 μg/ml MOG35–55 or 5 μg/ml Con A and measured the production of IFN-γ, TNF-α, IL-2, IL-3, IL-4, IL-5, and IL-10 by ELISA in supernatants collected after 48 h of culture. The Th profile of the cytokine response in the draining lymph node was different among the three groups (Fig. 3⇓). Similar levels of IFN-γ were produced by wild-type and IL-12p35−/− mice in response to MOG35–55, whereas IL-12p40−/− mice were defective in autoantigen-specific production of IFN-γ. This observation was confirmed by intracytoplasmic flow cytometry, which showed MOG35–55-specific production of IFN-γ by CD4+ T cells in wild-type and IL-12p35−/− mice (Fig. 4⇓). 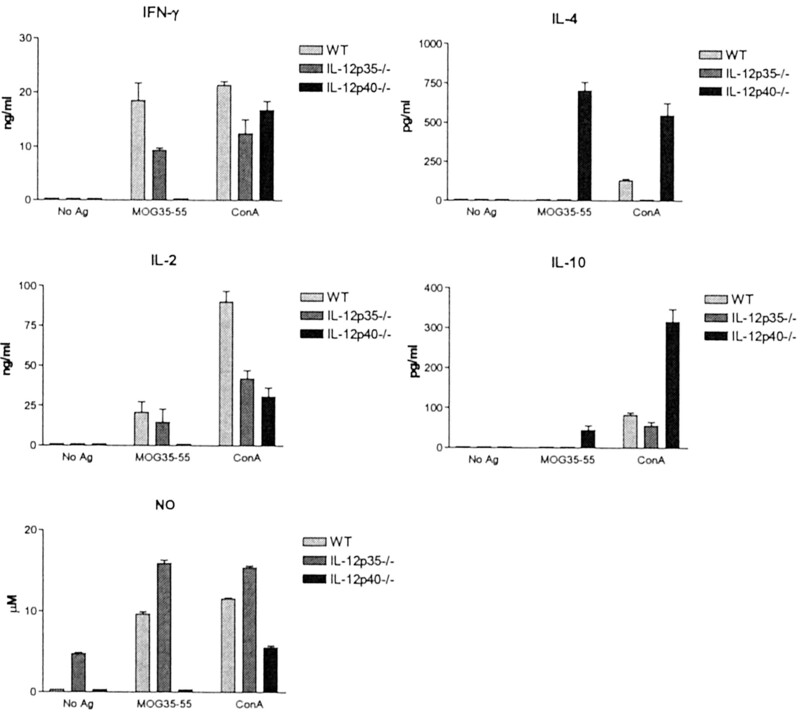 IL-2 production was detected only in response to Con A and was higher in wild-type mice than in IL-12p35−/− (p < 0.03) and IL-12p40−/− mice (p < 0.03). TNF-α was below detection limits (not shown). Production of IL-3 was higher in IL-12p40−/− than in wild-type (p < 0.01) and IL-12p35−/− mice (p < 0.01) (data not shown). 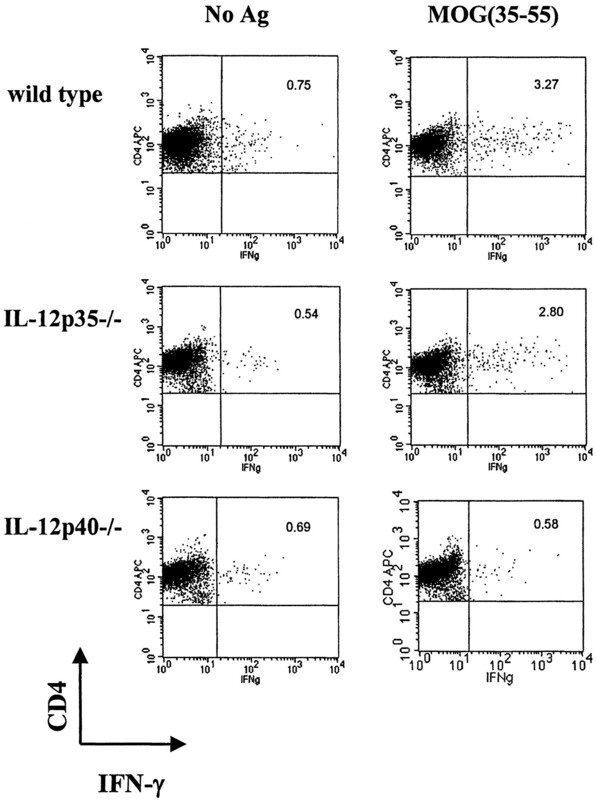 Higher levels of the Th2-type cytokines IL-5 (p < 0.001) and IL-10 (p < 0.001) were detected in IL-12p40−/− mice compared with those of both wild-type and IL-12p35−/− mice (Fig. 3⇓). IL-4 production was below detection limit in all mice (not shown). Cytokine production in response to MOG35–55 in the draining lymph nodes. Lymph node cells (4 × 105) from wild-type, IL-12p35−/−, and IL-12p40−/− mice were harvested and cultured in the presence or absence of 25 μg/ml MOG35–55 or 5 μg/ml Con A. Production of cytokines and NO was determined in culture supernatants collected at 48 h as described in Materials and Methods. Data represent mean and SD of triplicate values. One representative experiment is shown. MOG35–55-specific production of IFN-γ by CD4+ T cells in the draining lymph nodes. Lymph node cells harvested from MOG35–55-immunized mice were cultured for 48 h in the presence or absence of 50 μg/ml MOG35–55. Brefeldin A was added during the final 4 h of culture. After staining for CD4, lymph node MNCs were fixed, permeabilized, stained for intracellular IFN-γ, and analyzed by flow cytometry. Analysis was gated on live lymphocytes based on forward and side scatter. Numbers represent the percentage of CD4+ T cells producing IFN-γ. The percentage of positive cells after intracytoplasmic staining with a control rat IgG was always <0.3%. We then analyzed cytokine expression in the spleen (Fig. 5⇓). MOG-specific IFN-γ production was higher in wild-type than in IL-12p35−/− mice (p < 0.05) and was undetectable in IL-12p40−/− mice. Consistent results were obtained by intracytoplasmic flow cytometry (Fig. 6⇓). MOG-specific IL-2 production was higher in wild-type and IL-12p35−/− mice than in IL-12p40−/− mice (p < 0.01). TNF-α was below detection limits (not shown). Production of IL-3 was higher in IL-12p40−/− than in wild-type (p < 0.01) and IL-12p35−/− mice (p < 0.01)(data not shown). Spleen cells from IL-12p40−/− mice stimulated with MOG35–55 or Con A produced higher levels of the Th2-type cytokines IL-4 and IL-10 than did those of wild-type and IL-12p35−/− mice (p < 0.01 for all comparisons; Fig. 5⇓). IL-5 production in the spleen was detected only in response to Con A in IL-12p40−/− mice (not shown). Cytokine production in response to MOG35–55 in the spleen. Spleen cells (4 × 105) from wild-type, IL-12p35−/−, and IL-12p40−/− mice were harvested and cultured in the presence or absence of 25 μg/ml MOG35–55 or 5 μg/ml Con A. Production of cytokines and NO was determined in culture supernatants collected at 48 h as described in Materials and Methods. Data represent mean and SD of triplicate values. One representative experiment is shown. MOG35–55-specific production of IFN-γ by CD4+ T cells in the spleen. Spleen cells harvested from MOG35–55-immunized mice were cultured for 48 h in the presence or absence of 50 μg/ml MOG35–55. Cells were stained and analyzed as described in Fig. 4⇑. Numbers represent the percentage of CD4+ T cells producing IFN-γ. The percentage of positive cells after intracytoplasmic staining with a control rat IgG was always <0.3%. In summary, we observed a Th1-polarized response to the encephalitogenic peptide MOG35–55 in the peripheral immune system of wild-type mice, a weaker Th1 response in IL-12p35−/− mice, and a Th2-type response in IL-12p40−/− mice. Finally, we determined the levels of NO in the supernatants of the lymph node and spleen cell cultures. Figs. 3⇑ and 5⇑ show that NO production was higher in wild-type and IL-12p35−/− mice than in IL-12p40−/− mice. This suggests that this macrophage-derived factor may contribute to the pathogenesis of this EAE model. We then focused on the CNS to analyze any differences in the composition of infiltrating and CNS-resident cells among the three strains of mice. We performed flow cytometric analysis on CNS MNC isolated from mice at the peak of clinical disease. In preliminary experiments, we found that the production of TNF-α, a proinflammatory cytokine involved in the pathogenesis of EAE, was consistently detected by intracytoplasmic flow cytometric analysis in the CNS of EAE mice. Therefore, we focused our analysis on the production of this cytokine. The immunophenotyping results from a typical experiment are shown in Figs. 7⇓ and 8⇓. The number of cells recovered from the CNS was greatly increased in EAE-susceptible (wild-type and IL-12p35−/−) mice compared with that of resistant mice (IL-12p40−/− mice; Fig. 7⇓E). We found that TNF-α was produced by CNS leukocytes (CD45+) in wild-type and IL-12p35−/− mice. Among CNS cells, both microglia (defined as CD11b+CD45low; Fig. 7⇓, R2) and infiltrating macrophages (defined as CD11b+CD45high; Fig. 7⇓, R3) produced TNF-α. 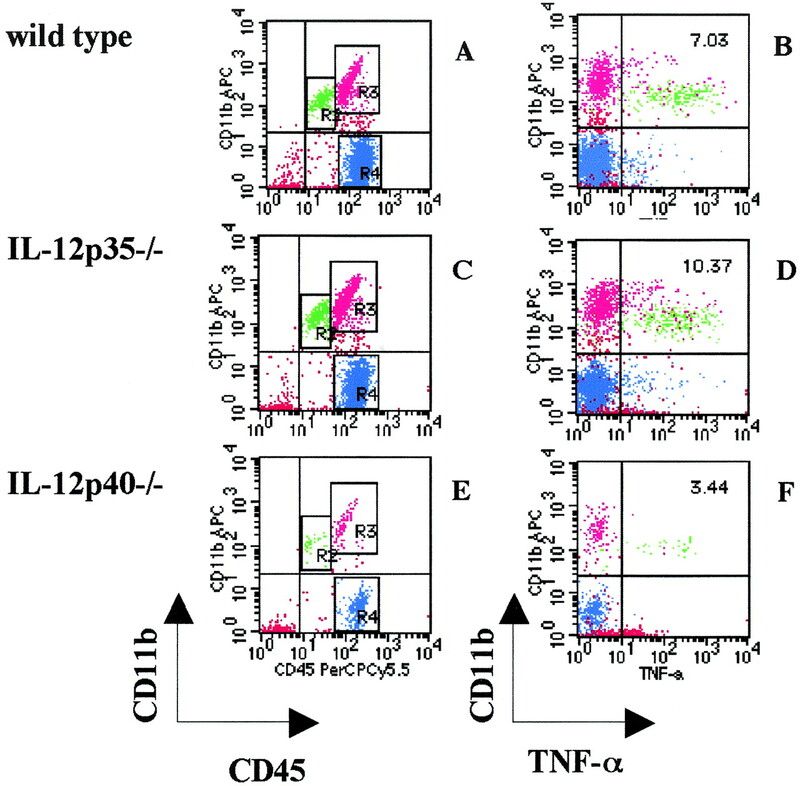 After incubation with MOG35–55 for 4 h, a fraction of CD4+ T cells also produced TNF-α in both wild-type and IL-12p35−/− mice (Fig. 8⇓). Thus, production of TNF-α by CNS APC and T cells correlated with disease susceptibility. Pattern of MNC infiltrates in the CNS of wild-type, IL-12p35−/−, and IL-12p40−/− mice. 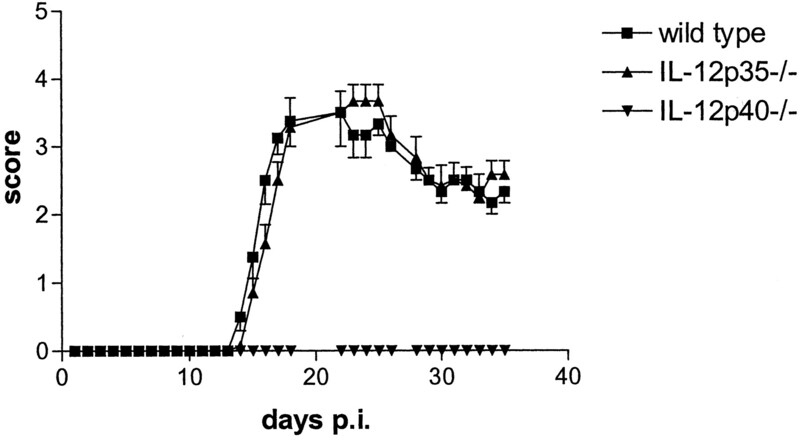 MOG35–55-immunized mice were sacrificed at day 30 (wild-type and IL-12p35−/− mice, score = 4; IL-12p40−/− mice, score = 0). Cells were isolated from the CNS and stained with anti-CD45-PerCPCy5.5 and anti-CD11b-APC mAbs. After fixation and permeabilization, cells were stained with anti-TNF-α-PE or a control IgG (not shown). Shown are viable cells (gated based on forward and side scatter parameters). Fewer events were acquired from IL-12p40−/− mice due to lower cell recovery from the CNS (the numbers of cells per mouse were as follows: wild-type, 1.2 × 106 cells; IL-12p35−/−, 7.2 × 105; and IL-12p40−/−, 4.8 × 104). The percentages of CD11b+CD45+ cells were similar in wild-type controls (A and B) and IL-12p35−/− mice (C and D), but markedly decreased in IL-12p40−/− mice (E and F). Higher percentages of TNF-α-producing cells (shown in the upper right quadrants of B, D, and F) were detected in wild-type and IL-12p35−/− mice compared with IL-12p40−/− mice. Microglia (CD11b+CD45low, R2) were the main producers of TNF-α, which was also produced by infiltrating macrophages (CD11b+CD45high, R3). TNF-α production by CNS-derived CD4+ T cells. Cells were isolated from the CNS by Percoll gradient centrifugation and incubated for 4 h in the presence of the protein transport inhibitor brefeldin A, with or without 50 μg/ml MOG35–55. Cells were washed and stained with anti-CD4-FITC. After fixation and permeabilization, cells were stained with anti-TNF-α-PE. Percentages of TNF-α+ cells are shown in the upper right quadrants. Percentages of cells stained with an isotype-matched control Ab were <0.5% for all groups (not shown). Fewer events were acquired from IL-12p40−/− mice due to lower cell recovery from the CNS (see Fig. 7⇑). The goal of our study was to characterize the role of IL-12p40 and IL-12p35 in EAE actively induced by the immunodominant peptide MOG35–55 in C57BL/6 mice. We report that IL-12p35−/− mice are fully susceptible to EAE induced by MOG35–55 on the H-2b background. This is in contrast with complete resistance to EAE in IL-12p40−/− mice. Consistent with the clinical findings, we showed that IL-12p35−/− mice exhibit CNS inflammatory infiltration and demyelination similar to those of wild-type mice (Fig. 2⇑). An important role for IL-12 in EAE has been suggested by studies in which the disease was enhanced by IL-12 administration or suppressed by its neutralization (5, 6, 8, 15, 16). We previously showed that IL-12 administration mimics the effect of superantigens in inducing and enhancing the severity and frequency of EAE relapses in (PL/J × SJL/J)F1 mice. Conversely, anti-IL-12p40 Abs blocked superantigen-induced, as well as spontaneous relapses of, EAE (6). Most studies conducted on EAE so far have only addressed the role of IL-12p40 in disease pathogenesis. The recent discovery of the IL-12-related cytokine, IL-23 (p40p19), which shares the p40 subunit and several biological functions with IL-12, suggests that IL-12p40−/− mice are in fact deficient for both cytokines, whereas IL-12p35−/− mice are only IL-12 deficient (9). In addition, neutralizing anti-IL-12 Abs used to suppress EAE were directed to the p40 subunit, suggesting that neutralization of both IL-12 and IL-23 may have been achieved (6). It should be noted that previous studies have characterized the role of IL-12 in different EAE systems, such as adoptive transfer EAE induced with proteolipid protein 139–151 in SJL mice (5); EAE induced by active immunization with whole MBP in (PL/J × SJL/J)F1 (6), SJL, and C57BL/6 mice (8); adoptive transfer EAE induced with MBP87–106 in SJL mice (8); and adoptive transfer EAE induced by a MOG35–55-specific T cell line in C57BL/6 mice (17). None of these studies specifically addressed the role of IL-12p35. EAE is considered an autoimmune disease mediated by pathogenic, myelin Ag-reactive Th1 cells (1). These cells produce proinflammatory cytokines such as IFN-γ, IL-2, and TNF-α upon activation by specific Ags. Thus far, the key role of IL-12 in EAE pathogenesis has been considered the induction and expansion of myelin reactive Th1 cells (8, 15, 18). To determine the relative strength of Th1 and Th2 responses to MOG35–55 in our system, we measured cytokine production by peripheral immune cells in mice immunized with that peptide. We observed a Th1-type response, with high levels of IFN-γ and IL-2 production in response to MOG, in wild-type mice. This observation is consistent with previous reports of the pathogenic role of Th1 autoreactive cells in this and other EAE models (8, 19). By contrast, we observed a strong Th2-type response to MOG in IL-12p40−/− mice. The production of high levels of IL-4, IL-5, and IL-10 most likely underlies disease resistance in these mice. Other investigators have reported increased Th2 responses in IL-12p40−/− mice, particularly a higher production of IL-4 (20). Ag-specific Th1 cells have been reported to induce production of IL-4 by mast cells in the spleen by an IL-3-mediated pathway (21). Our data suggest that IL-4 produced in the spleen of IL-12p40−/− mice may be partly induced by IL-3. In the absence of a significant Th1 response to MOG35–55 in these mice ( Figs. 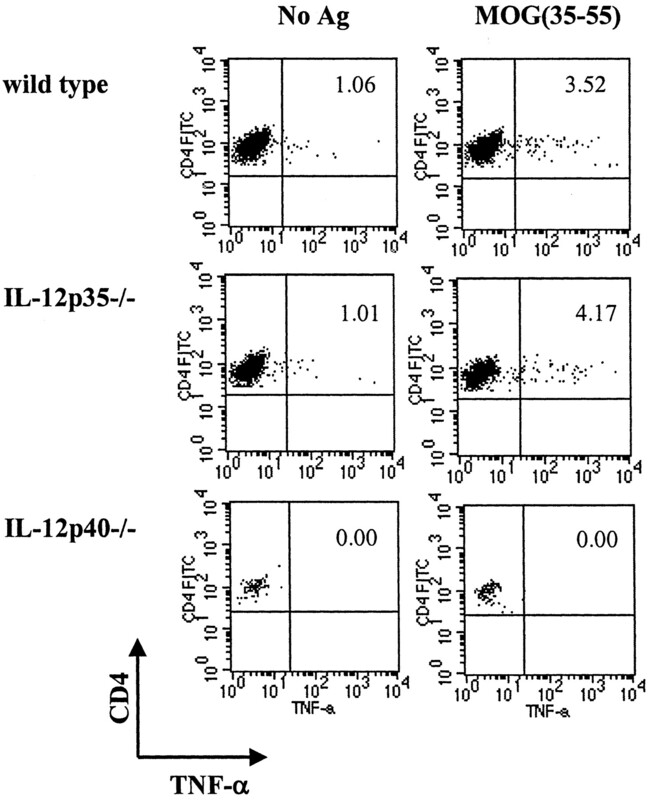 3–6⇑⇑⇑⇑), it is possible that IL-3 is produced by Th2 (22) or NK T cells (23). This is currently under investigation. The production of high levels of IL-10 (Figs. 3⇑ and 5⇑) is consistent with the concept of an immunoregulatory circuit in which IL-10 antagonizes the disease-promoting effects of IL-12 (8). Interestingly, we found that IL-12p35−/− mice were able to mount an encephalitogenic proinflammatory response to MOG35–55. In the draining lymph node, we did not find significant differences in IFN-γ production between wild-type and IL-12p35−/− mice (Figs. 3⇑ and 4⇑). In contrast, a relative deficit in IFN-γ production was observed in the spleen (Figs. 5⇑ and 6⇑). Overall, we observed a milder deficit in Ag-specific IFN-γ production in IL-12p35−/− mice than that reported for mice infected with Leishmania major (24) or immunized with keyhole limpet hemocyanin (25). Together, these data suggest that IL-12p35−/− mice mount a weaker Th1 response to MOG35–55 than do wild-type mice, whereas IL-12p40−/− mice mount a Th2-type response to the same peptide that is characterized by a severe deficit in IFN-γ production and high production of IL-4, IL-5, and IL-10 (Figs. 3⇑ and 5⇑). Our observation is strongly supported by recent reports that demonstrated the capacity of IL-12p35−/− mice to mount partial Th1 responses and thereby survive infection by M. tuberculosis (26) and Salmonella enteritidis (27). In the same studies, a severe deficit in IFN-γ production by IL-12p40−/− mice correlated with high susceptibility to bacterial growth and increased mortality. In addition, IFN-γ production was impaired in IL-12p40−/−, but not IL-12p35−/−, mice in a murine model of cardiac transplant rejection (28) and hapten-induced colitis (29). Thus, the level of IFN-γ production in IL-12-deficient mice is dependent on experimental variables such as the type of immunization and/or infection. In the absence of IL-12-mediated activation of Stat4 via the β2-chain of the IL-12R (3), we speculate that IFN-γ production may be induced by IL-23 through activation of Stat4 via the heterodimeric receptor for IL-23 (IL-12Rβ1/IL-23R) (30). In addition, Stat4-independent pathways, such as those activated by IL-18 (NF-κB, p38 mitogen-activated protein kinase, and growth arrest and DNA damage gene 45) may also be involved (30, 31). Because IFN-γ is a key factor in the development of Th1 responses, but is clearly dispensable in the induction of EAE (32, 33, 34), we investigated the role of other proinflammatory cytokines in our experimental model. TNF-α was an obvious candidate because of its involvement in EAE pathogenesis (35). TNF-α production was below detection level in the periphery. The production of TNF-α in the CNS at the single-cell level was studied by intracytoplasmic staining and flow cytometric analysis (Figs. 7⇑ and 8⇑). We found that EAE-susceptible (wild-type and IL-12p35−/−) mice, but not EAE-resistant (IL-12p40−/−) mice, had high numbers of TNF-α-producing cells in the CNS (Figs. 7⇑ and 8⇑). TNF-α was produced by both CNS-resident APC (microglia, CD11b+CD45low) and infiltrating APC, such as activated macrophages (CD11b+CD45high), as previously reported by Juedes et al. (36) in wild-type C57BL/6 mice. TNF-α production was not impaired in resident microglia in IL-12p40−/− mice (Fig. 7⇑F), but much fewer TNF-α-producing infiltrating macrophages were observed, in agreement with the Th2-type response observed in the periphery ( Figs. 3–6⇑⇑⇑⇑) and the lack of CNS inflammation (Fig. 2⇑). After a short in vitro activation with MOG35–55, we also detected production of TNF-α by a small percentage of CNS-infiltrating CD4+ cells in wild-type and IL-12p35−/− mice, but not in IL-12p40−/− mice. The correlation between TNF-α production in the CNS and disease susceptibility in both wild-type and IL-12p35−/− mice suggests the involvement of TNF-α in EAE pathogenesis. TNF-α is produced by both Th1 cells and APC and is thought to be involved in EAE pathogenesis through oligodendrocyte cytotoxicity, the up-regulation of the expression of adhesion molecules, and the induction of chemokine production (36, 37, 38). Interestingly, transgenic mice overexpressing IL-23p19 produce a higher level of TNF-α than do wild-type mice, and such overproduction may contribute to the systemic inflammation and premature death in these mice (39). We speculate that IL-23 may substitute for IL-12 in the induction of TNF-α and perhaps other aspects of Th1 cell development in IL-12p35−/− mice. Because signaling through TNFRI has been shown to correlate with severity of clinical signs and demyelination in MOG-induced EAE, whereas TNFRII may play a protective role (38), it will be important to determine the level of expression of these key receptors in CNS cells during the course of inflammatory demyelination. Finally, another mechanism of CNS inflammatory damage in both wild-type and IL-12p35−/−mice may relate to the production of NO by CNS-infiltrating macrophages as well as CNS-resident microglia. Indeed, we found that MOG35–55 induced the production of significant amounts of NO in lymph node and spleen cell cultures of EAE-susceptible wild-type and IL-12p35 mice (Figs. 3⇑ and 5⇑). In contrast, NO production was negligible in IL-12p40−/− mice. Therefore, even though both toxic and protective roles have been demonstrated for NO in EAE (40), NO production by CNS-infiltrating MNCs in this EAE model may contribute to inflammatory demyelination in both wild-type and IL-12p35−/− mice. This may occur by direct toxicity to oligodendrocytes as well as by enhancing the toxicity of TNF-α (Figs. 7⇑ and 8⇑) (40, 41). The observation of typical MOG35–55-induced EAE in IL-12p35−/− mice indicates that IL-12 plays a dispensable rather than an obligatory role in the induction of EAE. This is consistent with the emerging view that IL-12 is one of several factors involved in the induction of Th1 responses and that its role can be at least partly substituted by other factors (4, 42, 43). One interesting candidate for such a role is IL-23 (p40p19), an IL-12-related heterodimer, which can induce Th1 differentiation of naive T cell precursors, at least in humans (9, 44). Although it was not the goal of this study to characterize the role of IL-23 in EAE, and certain important reagents are not yet available for this purpose, our report suggests a possible role for IL-23 and/or other IL-12-related heterodimers in EAE, which will require further investigation. Consistent with the present report, we recently observed that mice deficient for IL-12Rβ1 (3, 30), and therefore unresponsive to both IL-12 and IL-23, are completely resistant to EAE, whereasIL-12Rβ2−/− mice, which maintain responsiveness to IL-23 (30), develop early and severe EAE. In addition, spleen cells of MOG35–55-immunized IL-12Rβ2−/− mice showed increased expression of IL-23p19 mRNA compared with that of wild-type mice, suggesting that IL-23 may indeed contribute to EAE pathogenesis (G.-X. Zhang, B. Gran, J. Li, S. Yu, I. Siglienti, M. Kamoun, and A. M. Rostami, unpublished data). In summary, we observed typical EAE in mice defective for IL-12p35 and complete disease resistance in the absence of IL-12p40. 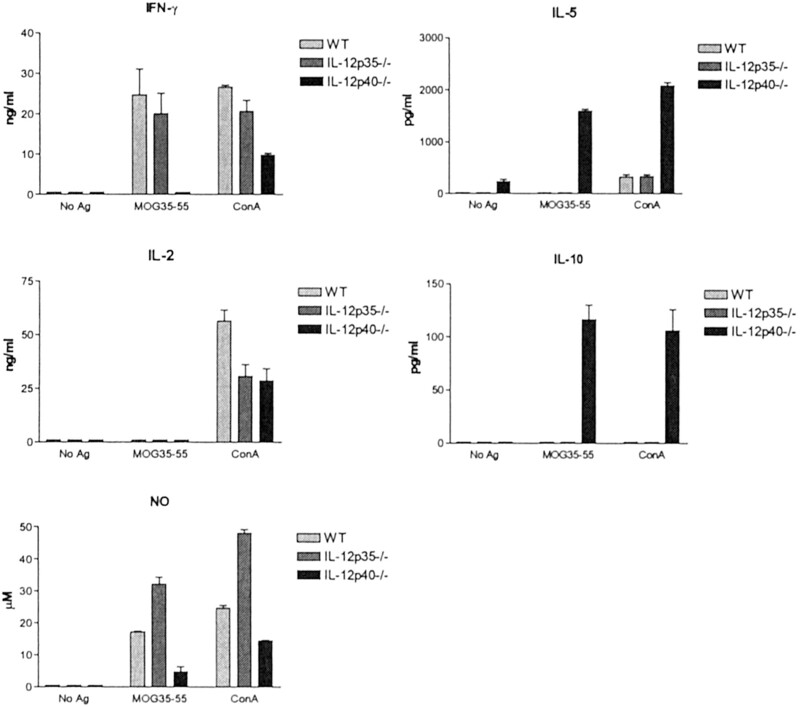 This suggests that pathogenic, MOG-specific autoreactivity can develop in the absence of IL-12 and that other p40 heterodimers such as IL-23 may compensate for the lack of IL-12. Because IL-12 has clearly been shown to expand pathogenic Th1 cells (4) and to exacerbate EAE (5, 6, 7), our study does not refute the role of this cytokine in organ-specific autoimmunity, but rather demonstrates a degree of redundancy in its function which had not been previously recognized. After submission of this manuscript for publication, Becher et al. (45) reported that, similar to the results shown in this study, IL-12p35−/− mice are susceptible to MOG35–55-induced EAE, while IL-12p40−/− mice are resistant. ↵1 This work was supported by grants from the National Institutes of Health and the National Multiple Sclerosis Society. B.G. is an Advanced Postdoctoral Fellow of the National Multiple Sclerosis Society. ↵3 Abbreviations used in this paper: EAE, experimental autoimmune encephalomyelitis; MOG, myelin oligodendrocyte glycoprotein; MBP, myelin basic protein; MNC, mononuclear cell; p.i., postimmunization.